I’ve only made marshmallows once before and I wasn’t hugely impressed with them. They didn’t have the texture I expected and the flavour wasn’t quite right. I saw these beautiful Milk Chocolate and Passion Fruit Marshmallows by Hint of Vanilla and I knew I had to give marshmallows another try. I’d also just received a delivery from Sous Chef which contained some passion fruit powder and strawberry powder, the timing couldn’t have been more perfect. If you’re a fan of marshmallows and you’ve never made your own, I urge you to give it a try. They’re fun to make, they taste much nicer than shop bought and well, they look so pretty! With bonfire night coming up, marshmallows are the perfect treat to make, they’re great in a hot chocolate, or toasted on the end of a stick and shoved in your mouth when they’re all charred! But be careful not to burn your tongue. 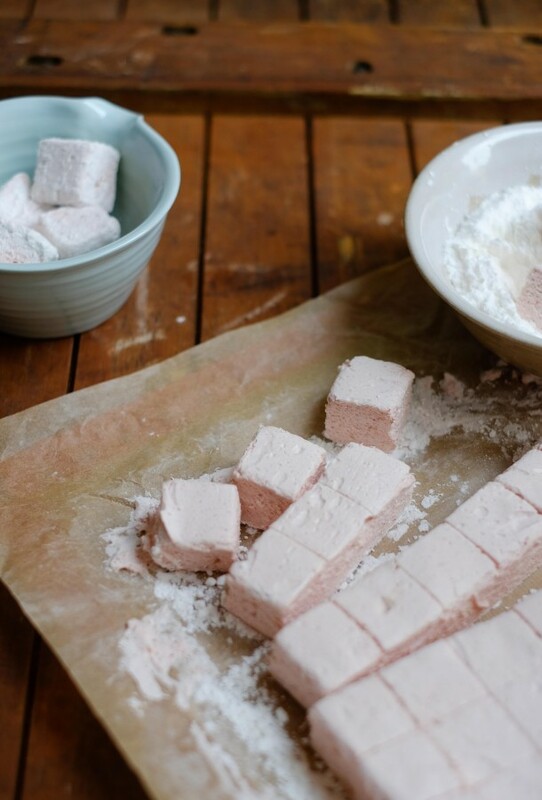 Marshmallows were traditionally a medicinal remedy made from the root of the marshmallow plant – I’m not making this up, there really is a marshmallow plant. The Egyptians and the Greeks used it to help with mouth, throat and gastric ulcers. Nowadays the marshmallow that is commercially available doesn’t contain marshmallow plant, instead they are made with gelatine and egg whites. 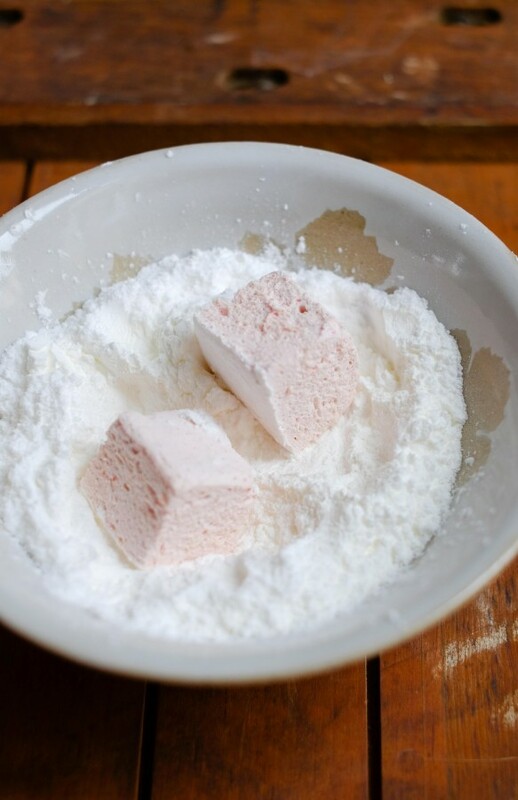 There are a lot of recipes out there for marshmallows, if you want to try some other flavour variations take a look at some of these; Gingerbread Marshmallows from Supergolden Bakes, Hibiscus Marshmallows from Camille Styles and these Ispahan Marshmallows from Raspberri Cupcakes. Grease a 20 x 20cm square tin with a flavourless oil (like vegetable oil) and line with baking parchment. Mix the corn flour and icing sugar together in a small bowl. Using a sieve, dust the parchment-lined tin with an even layer of the icing sugar and corn flour mixture. Place the gelatin in a bowl of cold water and leave it to soften. Remove the gelatin from the water and squeeze out any excess. Place the gelatin in a small metal bowl set over a pot of simmering water and melt it, do not let the gelatine simmer. Keep it warm until you are ready to use it. Melt the white chocolate, either using a bain-marie or in the microwave on short bursts - be careful white chocolate can burn very easily. Keep the chocolate warm, so that it stays runny. Place the egg whites in the bowl of a stand mixer with the whisk attachment fitted. Mix the granulated sugar, liquid glucose, and water in a large saucepan and bring to a simmer over a medium heat. Stir to dissolve the sugar, then simmer for about 5 minutes, until the syrup reaches 121C. Let the syrup continue to cook and turn the mixer to medium speed, whisk the eggs until they are at soft peak stage. Continue to boil the syrup and when it reaches 138-140 C remove it from the heat. Turn the mixer to medium speed and slowly pour the syrup into the egg whites. Pour in the gelatin, increase the speed to medium-high, and mix for about 5 minutes, until the mixture is thickened, glossy, and warm but not hot. Add the freeze-dried strawberry powder and whip for 30 seconds to mix it evenly. Gently fold in the melted chocolate with a spoon and make sure it's evenly mixed. Spread the marshmallow into the prepared pan. Rub a small offset spatula with oil and use that to smooth the surface of the marshmallow. To get an even and flat surface, cut a 20 x 20cm square of parchment and rub one side with the oil. Place the oiled side down on the surface of the marshmallow and gently press down. Leave the marshmallows to set at room temperature overnight. When set, remove the square of parchment paper and lift out the marshmallow using the parchment. Rub a sharp knife with vegetable oil, trim the edges of the marshmallow and then cut them to your desired sizes/shapes 2-3cm squares are most common. Dust the marshmallows with the icing sugar corn flour mix to prevent them from sticking together. Store in an airtight container at room temperature. 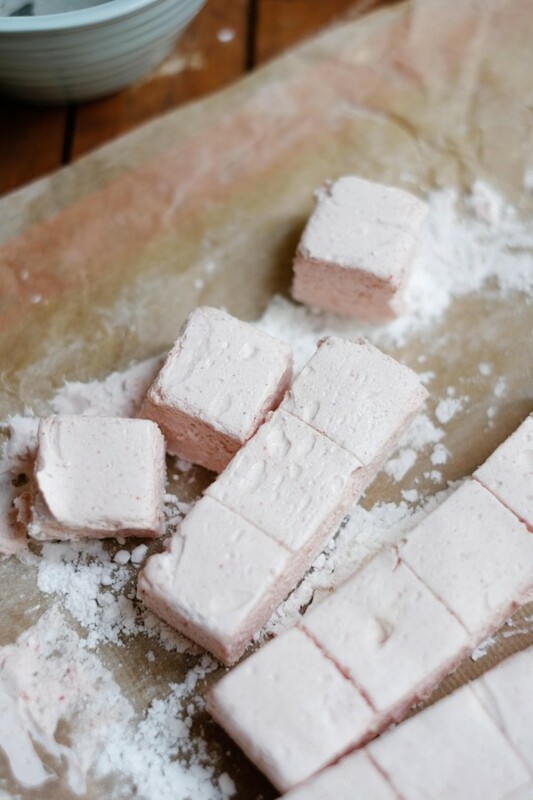 Have you made homemade marshmallows? Are you a fan? Will you be going to any firework displays in the coming week? I’m really fussy about marshmallows too, so I know exactly what you mean! These are good and you’re so right about bonfires. Oh I absolutely love marshmallows! Unfortunately, it is the one thing that my husband despises. Luckily for me, that means that, if I make rocky road, I get to eat it all myself 😉 I’ve never tried making my own marshmallow before. Thanks for inspiring me! My boyfriend hates them too! I had to give a lot of them away to stop me eating them all! Annoyingly he doesn’t mind them in rocky road, so I’d still have to share that. 🙁 Give the marshmallow a try, it’s much easier and much less sticky than I thought it would be! WOW – that is all I have to say! Aww thanks so much Shari! I clicked on the post to learn more about the marshmallow plant, so cool! Absolutely love these marshmallows as well. They came out well, and I love the flavor. Thanks for bringing them to the fiesta, and have a wonderful weekend! Thank you Kalia, They were very fun to make and it’s interesting to see there was once a medicinal side to marshmallows! Thanks for commenting. Thanks Lucy. Fun to make and fun to eat 🙂 Thanks for hosting Fab Foodie Friday. I’ve never made my own marshmallows, but these are so pretty, and would be a lot of fun to make! They’re really fun Julie and they don’t taste artificial like the shop bought ones. Thanks for such lovely comments. I’m glad you like them. Wow!! You nailed marshmallows. My daughter will love this . Oh wow! This is my first time to know about the marshmallow plant. It’s nice to know about it – thank you. Thank you for your lovely comments, you should definitely try making marshmallows. These look so good! I really need to get some freeze dried fruit powders, it is such a good idea. I’ve never made marshmallows before but I think that if it is possible to make my fiance love me any more than he already does then making him marshmallows is the way to do it! How fun! 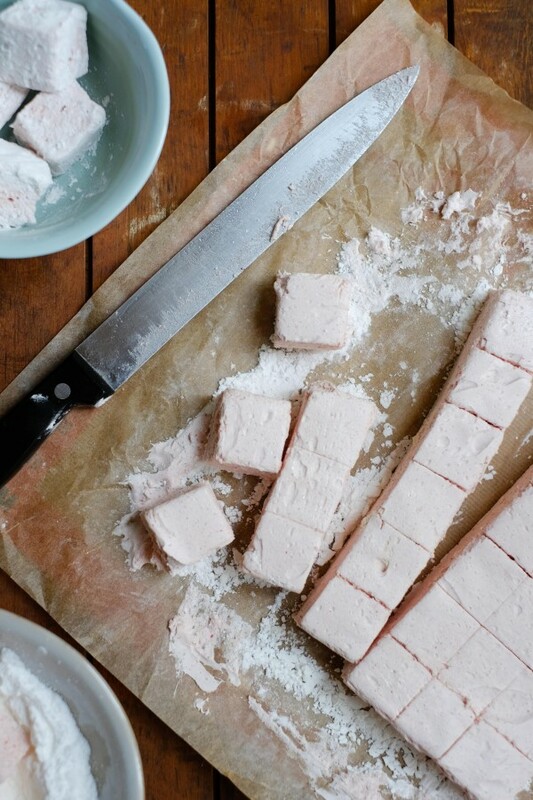 Have only had store-bought marshmallows but making them does sound like fun. Your flavored marshmallows would be great for smores. I only like to eat marshmallows if they’re toasted in a fire. I love them charred too! I let mine catch on fire for a few seconds, then they’re perfect. These look so perfect, Angela! I’ve never made homemade marshmallows, but I imagine I’d enjoy them much more than the store-bought version. I usually only enjoy the store-bought kind when they’re toasted and gooey – they taste far too fake and sugary when they’re not roasted. But I can see this homemade version being the perfect alternative to that fake quality you get with the store ones. These are such a pretty, delicate pink color too – so lovely! Thank you Beeta. I was inspired by another favourite blog of mine, Hint of Vanilla. I agree with you about shop bought marshmallow, they’re very synthetic. I was so pleased with the colour of these! 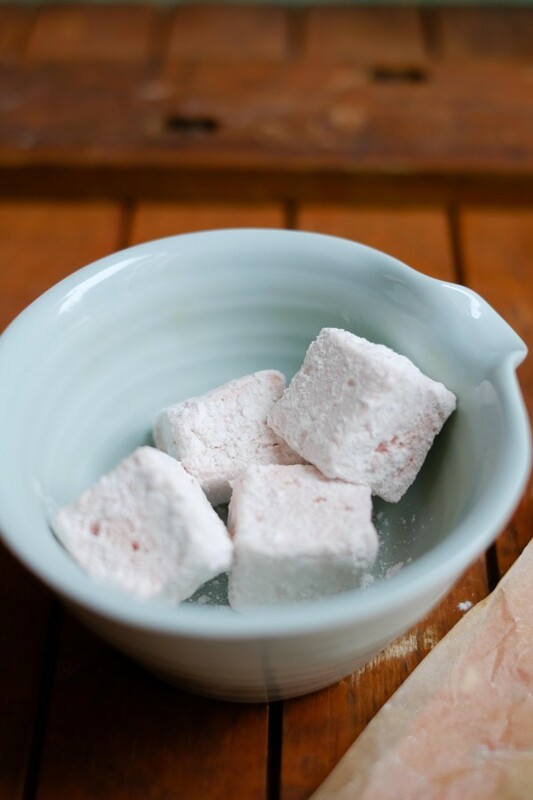 I really love homemade marshmallows and if I had the glucose syrup I would be making a batch right now! These look so tempting – I need to get some freeze dried strawberry powder for sure. the freeze dried powders are great, they don’t alter the texture of anything or the consistency and the flavour is really intense. I shall definitely be making these again soon. Definitely try it, if you want to make these even easier just omit the white chocolate. As the timing is the hardest part of the recipe, making sure everything is melted and at the right temperature.